This beautiful country house is located at 300 m altitude in the hills and in the Val Vibrata. You have a panoramic view. 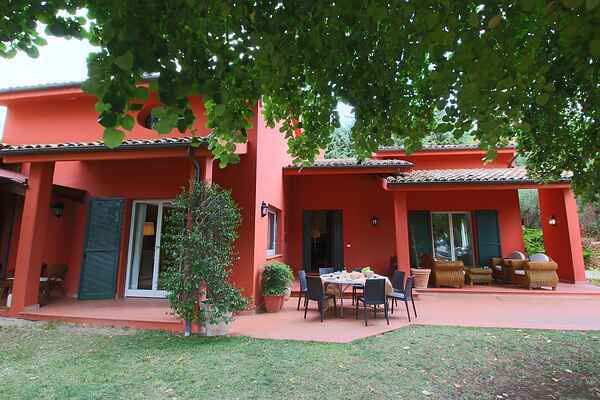 The house consists of a villa and an annexe with a total of 8 apartments. There is a spacious garden and a communal pool. The apartments are fully renovated and tastefully decorated. The mansion is situated in the hills of Teramo, in the middle of the green landscape. The sea is only 3 km and about within 30 minutes you can be in the mountains. Especially the Gran Sasso National Park and Monti della Laga are very worthwhile. The mansion is situated in a unique location between the sea and the mountains and is an area away from the crowds. The beautiful town of Ascoli Piceno is a 20 minute drive and is fun to visit. There is also a restaurant where you can order typical regional dishes. It is mainly local produce used including vegetables, meat and wine. Enjoy the hilly area in a country house between the sea and the mountains! Starting next spring, 2012, customers will have a nice service restaurant offering breakfast, lunch and dinner with local products. Half board (breakfast and dinner) at 25.00 euros per person (adults) per day, 40% discount for children up to 5 years, 20% discount from 5 to 12 years. Light lunch from 10.00 euros per person per day. In the above prices are including drinks. Upon request, can be booked on the beaches of Villa Rosa and Alba Adriatica (5 minutes from holiday home), umbrellas and beach beds. One umbrella and two sun beds: 8 euros per day in the month of April, May, June and September, 10 euros per day in the month of July, 12 euros per day in the month of August. There are many possibilities for recreation: hiking in the mountains (National Park of Gran Sasso and Monti della Laga) or spend the day in our nearby sandy beaches. And then work in sports such as hiking or water sports, organize cultural tours in the charming medieval villages of Abruzzo (Civitella del Tronto with its fortress) and Marche (Offida) to food and wine tours with tasting of typical products, visits to wineries (wine, olive olives, cheeses and cold cuts, etc..). In summer the coast is that the interior offers a myriad of recreational opportunities: food festivals (New Torano, Colonel, Controguerra) artistic, cultural and musical (in Campli the Blues Festival and Castelbasso exhibitions of painting and sculpture), representations medieval ("La Quintana" in Ascoli Piceno), sporting events (national Beach Rugby tournament). If you want to spend some 'time for shopping you can enjoy the attractive opportunities that the company stores offer (Paciotti shoes and clothing, European Culture clothing, Tods and Hogan shoes, handbags and clothing, "Guardians" shoes). The panoramic view of "The stables of the Civita" reveals the infinite potential of the place: it will be possible to go from the National Park of Gran Sasso and Monti della Laga up to our sandy beaches (3 km) in time to take a look. Or, alternatively, visit culturally rich towns like Ascoli Piceno (only 20 minutes), candidate for UNESCO World Heritage.